Happy Monday, it’s been a long while since I’ve posted a recipe here. Recently, during my food exploration, I visited Trader Joe’s and they were selling a 12 oz. bag of organic broccoli slaw for only $1.69. In addition, my boyfriend and his friends visited Apple Festival at the Harbes Family Farm where he gave me Blondie apples, gala apples and honey crisp apples. Finally, I found leftover unopened pack of Dole Caesar Dressing Vinegrette from Caesar Salad Kit. With the three ingredients, one of each kind of apple was diced. All of the broccoli slaw and apples are combined. The dish was completed with the Caesar Dressing. It’s simple, quick way to utilize leftovers while using fresh healthy, organic ingredients. 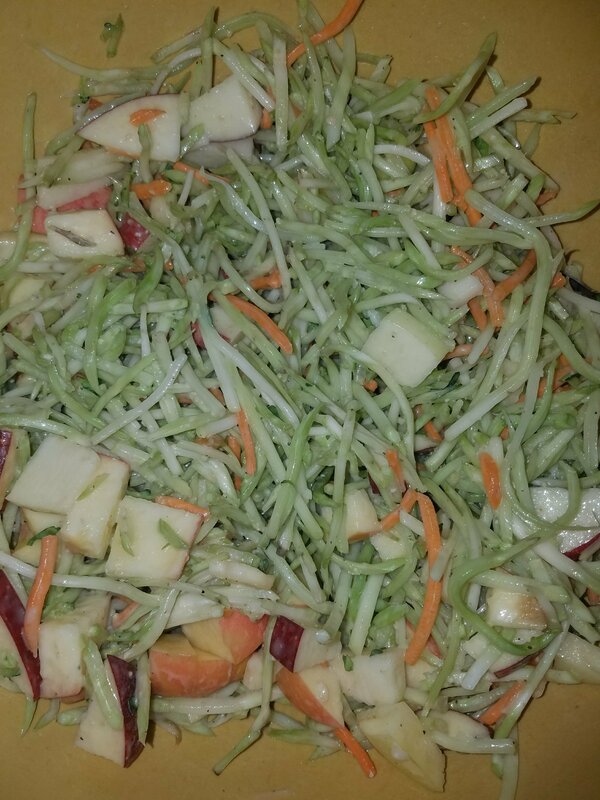 This entry was posted in Meatless Monday, Uncategorized and tagged 3 ingredients, apples, Blondie apples, broccoli, broccoli slaw, Caesar Dressing, cheap eats, cheap meal, Dole, foodie, gala apples, Harbes Family Farm, healthy, honey crisp apples, Meatless Monday, no cooking involved., organic, quick, vegetarian. Bookmark the permalink.